Troubled Water. Nalini Adinarayanan. World of Water Correspondent, Bangalore, Karnataka. “The two states of India, Tamil Nadu and Karnataka, are today, fighting. One river flows through both the states and whilst Tamil Nadu has got the court ruling to get more water, both are now fighting over who gets the most but this is no longer just a legal battle for now they fight with weapons. Shops are shut down and offices are closing early. “The Global Water Crisis. The next war will be over water! Water is more fundamental than any other substance on Earth: you can live three weeks without food, but without water you’ll be dead in three days. Water cannot simply be a commodity to be exchanged and bartered by a few corporations, owned and controlled by big business. It is a human need and a right. That’s why I’ve written this book, with Brooke Shelby Biggs, Troubled Water: Saints, Sinners, Truths and Lies about the Global Water Crisis – a vivid collection of essays by some of the world’s most powerful thought leaders, activists and luminaries who reveal that perhaps the single biggest threat to human rights, economic justice and even human life and civilisation itself may be something as elemental as water. It flows out of our taps easily enough that we rarely give it a second thought, but we ignore it at our peril! We buy gallons of so-called designer bottled water – some of it no fresher or cleaner than what comes out of our taps, but retails 1,000 times more expensive. A prime example, and who also hit the headlines earlier this year with Dasani purified, noncarbonated water enhanced with minerals is the Coca-Cola company who decided years ago that it could make more money selling us water than soda pop. Yet 1 billion people worldwide do not have any water within a 15 minute walk of their homes. Over 300 million people – some say more – have been displaced by dams worldwide. There are now so many dams on earth, they have literally caused the planet to wobble on its axis. In towns from Cochabamba, Boliva to Atlanta, Georgia, private corporations have taken over public water utilities, jacking up prices and forcing thousands to choose between paying the water bill or buying shoes for the kids. Meanwhile, as prices go up, in almost every case water quality goes down. Fortunately, communities are learning to demand better and organizing to force corporations and the governments that enable them, to give back what is and should be considered a human right instead of a commodity to be traded for profit. The culture of fighting back is winning some important victories, but the struggle has many fronts and innumerable corporate and bureaucratic villains. Thankfully, there are plenty of community and organizational saints and. I want you to be equipped with this knowledge so that you know the enemies and celebrate the heroes, and that’s what this book is all about. 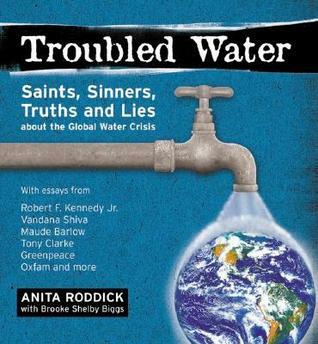 * Troubled Water: Saints, Sinners, Truths & Lies About the Global Water Crisis is in the World of Water reference library. The Global Water Crisis. The next war will be over water! We’re getting a bit worried about what might be a fresh Water War in India. If you have any news or people over there that we might contact, please leave a message at the World Clean Water Campaign web site marked for my attention. A copy of ‘Troubled Water’ is now in the World of Water Library. Having read it from cover to cover, it’s a powerful, thoughtful, useful, valuable, well directed and researched publication. The power we have over our future is enormous, so long as we focus it together. Books like this, and this website, provide good focus. All of us must power-up and together, create the energy required to make the changes to the World that are vital. Add to this site to build up the global energy. Only with energy and caring can we build the sort of tomorrow that allows our survival. If we drive forward without care, we’ll crash – we’ll have failed as a species. Let’s win out there – let’s care!